Linux-sunxi support is not yet available, due to lack of devices and software. These pages have been put together by scraping information from the SDK. The SDK contains customized sources for U-boot, Linux, Android and buildroot. Boot0 initializes the DRAM, basic clocks and loads U-boot from NAND or MMC. There is no boot1 on A80. Boot0 directly loads U-boot. Unfortunately you need the ARMCC (proprietary ARM C compiler) to compile the source code. Under windows, no driver can be found, but it is however possible to force the installation of the fastboot driver. To make fastboot work from a PC, we need to change the fastboot code because Google hard-coded its partners into the fastboot source code. To be able to use fastboot we need to add 0x1F3A as Allwinner and compile this. A prebuilt windows binary is available here. The cubietech guys have a kernel available. As is usual, there are the libnand and libisp violations. But with A80, Allwinner decided to step this up a notch, or two, or all the way to 11.
drivers/devfreq/dramfreq/mdfs/mdfs_sun8iw3p1.code Dram frequency scaling binary, run from SRAM while SDRAM is inaccessible. drivers/devfreq/dramfreq/mdfs/mdfs_sun8iw6p1.code Dram frequency scaling binary, run from SRAM while SDRAM is inaccessible. drivers/arisc/binary/arisc_sun9iw1p1.bin Cortex-M3 core for deep power save modes. drivers/video/sunxi/disp/de/lowlevel_sun9iw1/libdsi DSI support for display. drivers/video/sunxi/disp/de/lowlevel_sun9iw1/libedp eDP support for display. drivers/video/sunxi/hdmi/aw/libhdcp HDCP support for HDMI. 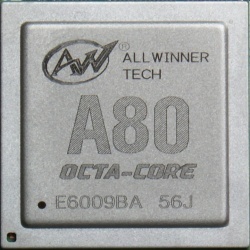 Board OptimusBoard (created by Merrii for Allwinner, is sent to selected users by Allwinner to test the A80). This page was last modified on 18 November 2018, at 12:10. This page has been accessed 92,230 times.